Made with Fresh Macintosh Apples and Wild Huckleberries. 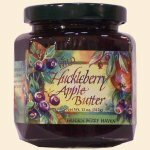 When apples are at their juicy ripened peak, we whip them with wild huckleberries. Smooth texture is perfect for muffins, toast or pancakes. Sure to please the finickiest of taste buds. Also available in a 5oz jar (Item #W510). Ingredients: Apples, Wild Huckleberries, Apple Cider, Sugar, Cinnamon, Clove.